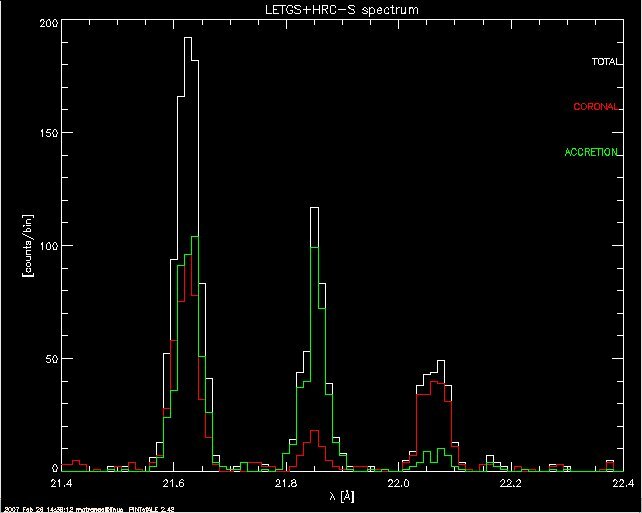 This thread uses PINTofALE to generate simulated Chandra Low-Energy Transmission Grating Spectrometer (LETGS) spectra. In particular, we will examine the emission of a hot corona along with the contribution to the X-ray emission from an accreting component. The Chandra gRSP files used here were obtained from the LETG Observer Information page. The Chandra Proposal Information page also contains gARFs and gRMFs for various orders and those may also be used. However, note that the formatting of the data in some of those files has been found to be incompatible with IDL's mrdfits() routine, and care must be taken to ensure that the arrays read in correspond to that given in Figure 9.17 of the Proposers' Observatory Guide. We use the gRSP files and set the gARFs to "none" in this thread. If gARF files are used, please ensure that the gRMF files are read in and not the gRSP files, which already include the gARFs. Update: The HRC-S/LETG gARF files are correct as of 6 Mar 2007. All the steps described here are repeated in the .par file: chandra_letg_ao9.par. T_a  	       = [6.3]	    	    	 ; log(T[K]) components in the EM for the accret. EM_a          = [3.3]*1d12	    	 ; Emission Measure [cm^-3] for the accret. ;	as ASCA, BeppoSAX, etc. can be dealt with in the same manner. ;	DEM and NH, and rescale the input EMs accordingly. ;	First find and read in the ROSAT/PSPC effective area. ;	is to do this. ;	example thread (see Section 1 and Section 2). ;	on the low-resolution spectrum generation. ;Read line cooling emissivities from the atomic database. ;and not ion balances. We will use fold_ioneq() to fold ion balances. ; which already includes ion balances and abundances. ; the abundance from the emissivities in such cases. ; and now calculate line intensities using lineflx(). ;We can read in continuum emissivities usingrd_cont(). ;observed rate of 1.0 ct/s. ;	repetition of the steps carried out to rescale the DEM. ;	only the total counts was important). ;	line and continuum intensities for the accreting and the coronal components. ;first for the accreting comp. ;section 3 above and we reuse those here. ; Combine the positive and negative orders to get a co-added spectrum. ;components for, e.g., the O VII triplet.